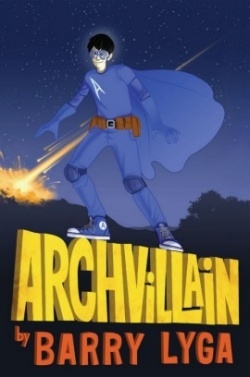 Archvillain by Barry Lyga. Grades 4-7. Scholastic Press, October 2010. Reviewed from ARC provided by publisher. Kyle Camden is just your slightly-above-average sixth grader (smart, super popular, and known prankster) until he's caught in a plasma shower in a field outside the small town of Bouring. Suddenly, his intelligence goes through the charts, he has super strength, and he can fly! But Kyle's not the only thing that changed that fateful night. Another kid was apparently caught in the storm. They're calling him Mighty Mike and the whole town adores him for his good deeds. Only Kyle can see Mike for w...more Kyle Camden is just your slightly-above-average sixth grader (smart, super popular, and known prankster) until he's caught in a plasma shower in a field outside the small town of Bouring. Suddenly, his intelligence goes through the charts, he has super strength, and he can fly! But Kyle's not the only one that changed that fateful night. Another kid was apparently caught in the storm. They're calling him Mighty Mike and the whole town adores him for his good deeds. Only Kyle can see Mike for what he truly is, only Kyle can defeat Mighty Mike and show the whole town his true colors... and if that turns Kyle into an archvillain, so be it! This is a fun and funny start to a new series. I was chuckling throughout the book. I love that the town is called Bouring. I love that Kyle's parents are such dips and that Kyle's honest attempts to help them are so misconstrued. I thought Lyga managed to make Kyle's archvillain character a sympathetic one. And okay, he's kind of a punk, but hmm... I can think of some other books about punky guys that kids are gobbling up... I was on board with Kyle. One minute he's Mr. Popular and the next minute, not only is someone else upstaging him, but Kyle keeps cleaning up after Mighty Mike's mistakes. Kyle's progression into Mighty Mike's archvillain was believable to me and I'll be interested to see where it goes in the next books in the series. I'd definitely hand this book to kids clamoring for superhero titles and kids who like funny stories. Check out Karin's review at Karin's Book Nook, Professor Nana's thoughts at The Goddess of YA Literature, and this interview with Barry Lyga at Literary Asylum. Archvillain will be on shelves October 1.